Do you ever get ahold of something and you’re not really sure what to do with it? Maybe you purchased a new car and opted for the “Limited” edition because of the tangible differences. You know…the trail rated tires, the leather trimmed steering wheel with the full blown navigation system. Then you drive out of the dealership scratching your head wondering what all the other buttons are for? Such as the button that supposedly turns on a real power outlet that’s tucked way back in the trunk (they say its for tailgating. Whatever.) I could go on and on, but I would run into the problem that my wife says I have. I tend to get too verbose at times. Well, I am the product of my mom, who was an English major. But, I digress. I recently, very recently procured myself the new iPhone 6s Plus. The Gold color, but you’d never know it was gold after placing it snuggly in my black OtterBox case to keep all of its unique parts and mind blowing technology safe. I love the video capabilities that all of the iPhones bring to the table. Ever since the introduction of the iPhone 5s in September of 2013, with its legit slow motion video capabilities did I notice a true separation with being able to use a phone as my primary video recorder. If you’ve upgraded to an iPhone 6s or 6s Plus, you’re probably a little bit curious, like me as to what the video capabilities of this baby has under its hood? Well, I’ll tell you, there are 2 significant additions that could easily be overlooked by someone who’s not diving into all of the video settings such as myself. Don’t worry, this is an easy explanation that’ll take just a few short minutes to read. Oh, and please excuse my kindergarten styled drawings. My creative talents are centered elsewhere, so I’m told. First, find the settings app on your iPhone 6s and scroll down a bit until you see the Photos & Camera. It should be squeezed in between the Videos and iBooks tab. Upon selecting Photos & Camera, you will see this screen below. Well, scroll all the way to the bottom and then you’ll see this particular part. Got it? Good. See the big red star? This is the area you’re going to need to focus on to determine the video settings you are going to record in. First things first, turn the Grid to ON. It will help with making sure all your videos are as level as possible. We’re going to discuss the Record Video tab first. This is setting for your main video tab when you launch the native camera app and the one you will shoot with most often. Take a look at this. If you’re a video junkie like myself, your eyes will immediately flow down to the last line and think, “Holy crap, this thing shoots 4k video.” And, you’ll know exactly what that means for your footage. If you’re not a video junkie and just want to know what is what, I’m going to spell the settings out for you in plain English. Don’t worry, your video quality is going to look fantastic, no matter which setting you choose. 1080p is the gold standard for HD television. That large 55″ television you watch all of your favorite college football games on or reality shows, most likely, if you have an HD box from your cable provider, you’re viewing those shows in 1080p HD. But here’s the thing, a lot of times, the signal feeding into our television set is a bit degraded even though we’re watching an HD channel. Unless you’re really paying attention, or watching fast moving sports broadcasts, the naked eye is going to have a hard time deciphering the fact that the downgraded signal is really pumping out 720p quality. No worries. To you and me, and Apple obviously because there’s an HD printed next to the number 720p, it’s still high definition. Here’s a litmus test for you, tune to the Golf Channel and wait for them to show a player hitting a golf ball, if you watch the ball closely you might see a bit of a “comet trail” or multiple balls as it screams down the fairway. This could be because the signal you are receiving is in 720 HD or your television is slow at processing, nevertheless, that’s really the only true way you can tell what’s what. 720p HD at 30 fps: Don’t worry, this is high definition, you can take comfort in recording in this setting, uploading to YouTube or Vimeo and having yourself a fine looking video. The plus side is if you’re running low on space, it will only take up about 60 MB per minute. Even Apple realizes this because they add their own opinion on this to help you out, calling it a space saver. 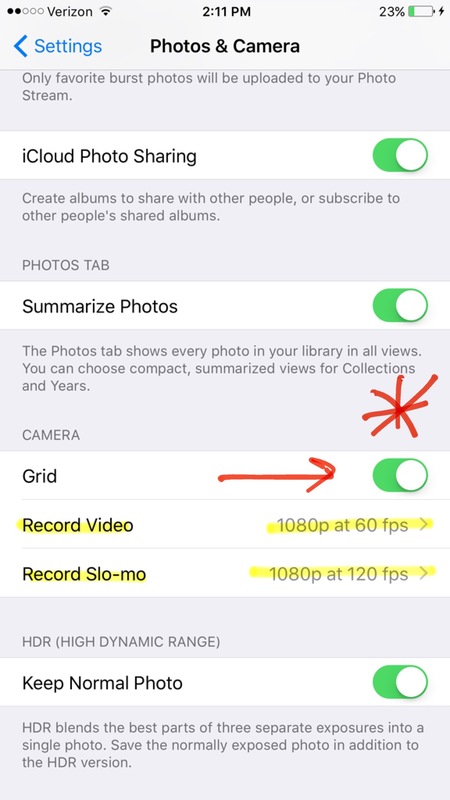 TIP – As long as you don’t plan on trying to slow this video down in an editing app, you will not see any degradation of your video footage and if you’re like me and wait until your phone starts creeping up on that dreaded Full Storage notice, capturing video with this setting will definitely help out. 1080p HD at 30 fps: Recommended setting. What I mean is, unless you plan on trying to save as much space as possible, this setting is what you should have your phone set to when recording everyday life as it happens. The resolution is top notch at 1080p and the 30 fps means that you’re going to be taking video and playing back video in the same basic settings that you watch your news broadcast or television show in. Most cinematic movies are shot in 24 fps, but, one there is no setting for 24 fps on the iPhone and two, 30 fps is close enough. 1080p HD at 60 fps: So why would you use this setting at all? It takes up almost double the amount of space for one minute of video as the previous setting and more than three times the storage than shooting at 720p? I agree. I don’t use this particular setting that often. Now some would surely call me crazy for not utilizing the 60 fps setting. Why? This could be used to present a much smoother looking playback of your video because it’s capturing twice as much video in the time that you record. See my 2nd grade math? (30 x 2 = 60, okay a little patronizing perhaps). If you use a video editing app such as iMovie, and if you decide to add a bit of slow motion, the footage should look fine. 4K at 30 fps: Okay, when I saw this setting I literally blinked a couple of times, paused, and then proceeded to sit in amazement to think that this new phone could shoot in 4K video. Just a couple of years ago, there were very few cameras capable of capturing video at this setting. 4K will be what all new televisions will certainly be equipped with going forward. Stop by your local Best Buy and ask the salesperson to show you the UHD TVs. After you stand there in awe for a minute or two at the crispness, you’ll look at the price tag and tell yourself to wait a year for the price to go down. 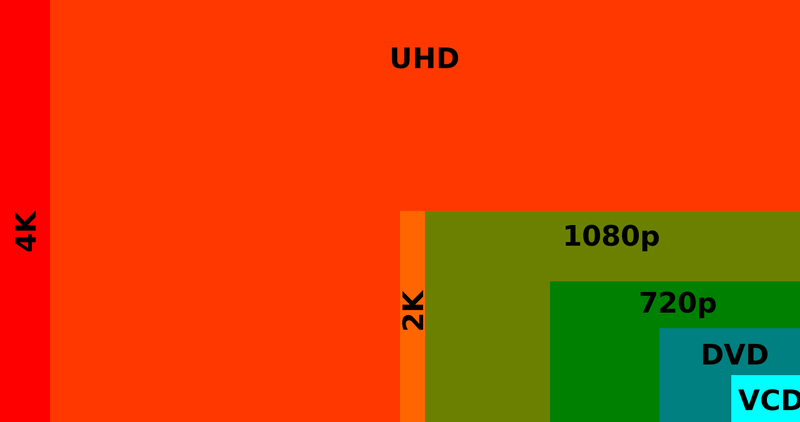 It is debated whether or not 4K and UHD is completely synonymous, but for all intents and purposes that’s how you’re going to hear it being advertised, so I’d just go with it. Notice the chart, which you can find on the 4K Wiki page. To keep it simple, just think 4,000 horizontal pixels as compared to 1,080 horizontal pixels. That’s a lot – and the difference will show up in the details and colors of what you choose to shoot. 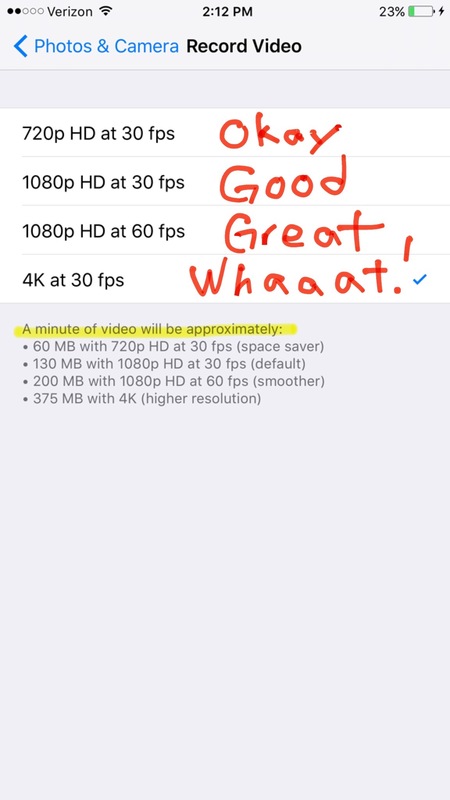 However, take notice that if you plan to record in the 4K setting with your iPhone 6s, understand that roughly a 2 1/2 minute video might take up 1GB of data. It’ll look fantastic though make sure to dump it onto an external hard drive for long term storage. How I love having the ability to record video in s l o w m o t i o n. Slowing down video can add depth, emotion and excitement to your video. Think about sports, or the cinema. It’d be safe to say that everyday at some point, we’re watching a story, or a highlight package from ESPN where slow motion effects are utilized. I personally record a good bit of my videos in slow motion. And, here’s the reason. By recording in slow motion, I am afforded the choice when editing my footage to add that cinematic feel if I choose to do so. If I didn’t capture the footage in 120 or 240 fps, then the video files I would be working with would limit me in how creative I wanted to be in the final edit. Allow me to jump back to the 1080p HD at 60 fps setting I mentioned earlier. I said, “if you decide to add a bit of slow motion, the footage should look fine.” That’s true, but notice the adjective I used to describe the footage, “fine”. It would look fine and most viewers probably wouldn’t catch on to the slight degradation of pixels and movement. However, by recording in 120 fps or 240 fps, you will allow yourself to slow the action down much more without the loss of fluidity and it will look beautiful. 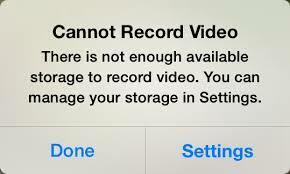 Again, please take note of the storage that these settings will demand. 1080p HD at 120 fps: This is new, sort of. Since the introduction of the iPhone 5s, a slow motion setting has been available. 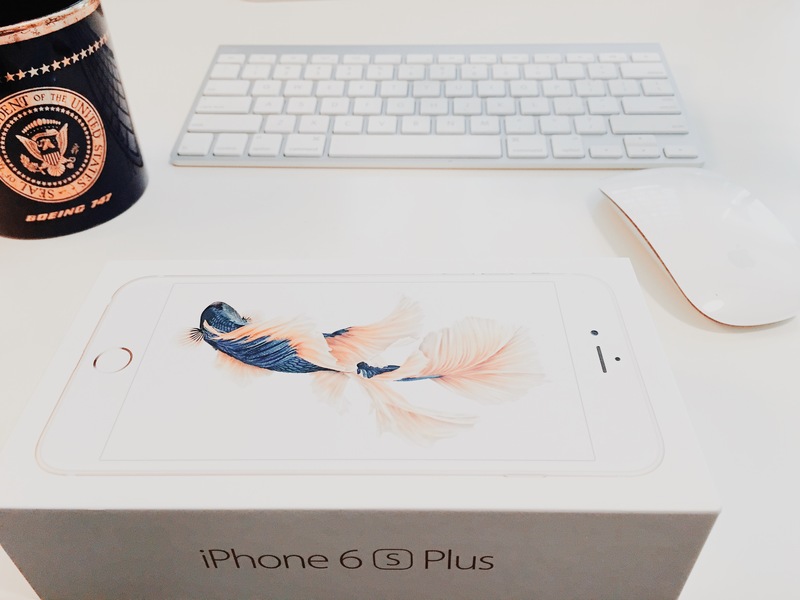 However, with the recent release of the iPhone 6s and 6s Plus this setting has been upgraded. The two previous iPhones, the aforementioned 5s and the 6 maintained a 720p HD at 120 fps setting. This is why I wrote in the words, “Makes me happy!” on the picture I embedded. 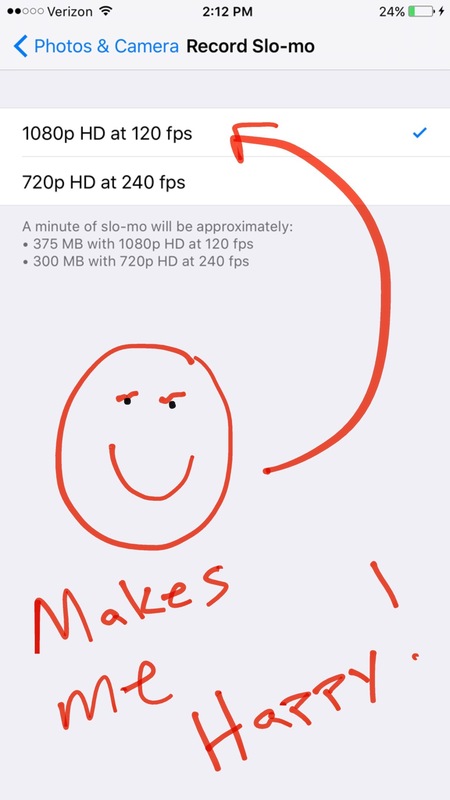 Again, most viewers will not be able to notice the difference between 720p and 1080p when they’re playing it back on their phones or viewing your video on a computer, but playback via Apple TV or projected on a large surface, absolutely a side by side comparison could show marked improvement with the 1080p HD at 120 fps. All in all, this is a nice change. 720p HD at 240 fps: I won’t get too far into the details of what 240 fps truly means, but for a golf swing, your child riding by you on a go kart or any other activity involving quick movements, this setting will set you up for video capture success. In most of the recent slow motion films I have created, this 240 fps is the setting I have chosen to go with. Do you have to slow it down all the way? No, you don’t, I plan for the amount of space it will take up and take comfort in knowing that if I do happen to capture something awesome and I choose to slow it down, it will look great. Here are a few selections of related content I captured using this 720p HD at 240 fps. Hold On To The Dog from JaWaVi Films on Vimeo. The one thing I tell most people when they ask me about video capture and whether or not they’re going about it in the correct way is to “just hit record”. It’s easy really, if you don’t take the time to have your phone at the ready and decide to just hit record, well, naturally you won’t have any footage. Now, the previous paragraph could be interpreted as either solid and simple advice, or a bunch of nothing, just some hollow words strung together to make myself feel like I was truly imparting some wisdom on someone. There are some other considerations one must plan for before attempting to take better video after learning what all of the settings are for. Don’t take vertical videos. Save those for your Periscope or Snapchat accounts. Try your best to keep your horizontal (see what I did there, subliminal reminders) videos stable. This doesn’t mean you need to go out and purchase accessories or tripods. Just last night, I was taking video of my wife at a bar as we had dinner. I grabbed a hi-ball glass, flipped it upside down and steadied my phone before I started to record. Hold your shot. This will help you focus on your subject and allow he, she or it to dictate the action. No need to go around moving your camera back and forth like your viewer is watching a tennis match. Don’t worry about sound. Wait. What? That’s right, you’ll find that unless you’re specifically wanting someone to speak and give a verbal cue about where you are or what you’re doing, more often than not a musical soundtrack will make for more exciting final video footage. Should you need sound, either have your subject pretty close to your iPhone (its mic is omni-directional) or purchase a tiny lavaliere microphone to plug into the headphone port. Stay away from the zoom function. You might think it will look good, but it won’t, trust me on this one. Should you need to get closer, use your feet. But try to hold it steady. Open up a YouTube or Vimeo account. Both are free. Vimeo is what I prefer because of the upload speeds, the beautiful design and the fact that my favorite video editing iOS app is Cameo and is owned by Vimeo. As for me, I keep my settings pretty much locked on 1080p HD at 30 fps for my regular video settings and lately have been utilizing the 720p HD at 240 fps for the slo-mo settings. However, now that the iPhone 6s can capture 1080p HD at 120 fps I will probably utilize the faster of the two slow motions options. I will sacrifice speed for better overall quality in resolution. Editing help for those of you who have video (or pictures) stuck on your device or hard drive and would like to create a memorable story or movie. Video consulting or capture in and around the Atlanta/Athens, Georgia area. Need a videographer, but think it will break the bank? Think of JaWaVi Films as your alternative to high priced, big budget videographers. Let’s talk, I work solo, utilize iPhones and GoPros and specialize in small video production and editing projects. Are you a realtor and need to sell a house? Have you seen the awful YouTube videos of property tours. Change it up, add a voiceover, include some unique shots and best of all, keep. it. short. See an example of a unique property shoot here. Want me to teach you what I do, how to learn what all your iPhone can do or maybe you’ve purchased a GoPro and you’re sitting there thinking…Now how do I use this thing? Quick question. First, great article. Well done. Ok, my question is, when I record on my 6s in slo-mo, the beginning and end of the clip play at regular speed. How do I stop that? I want the whole video to be slow. Go to your camera roll –> Select the video you want to slow down –> Tap Edit at the top right of your screen –> Look for the slider directly under the photo –> There, you can use your finger to slide out or extend out the slow motion effect –> Click Save. Thanks for your article. Can you tell me how to save a still image from a slow motion video taken with my iPhone 6S? Right now I have the videos on my iPhone and my macbook. Can I capture a still image in Photos on my macbook? Thanks for any help! Hi Mitch. You can take a still image with your iPhone while its filming by tapping the tiny white button in the top left of the screen. I do this all the time. Sort of like killing two birds with one stone bc you’re getting your shot and allowing yourself to capture a few stills along the way. Can you capture a still image from your videos currently on your MacBook? Sure. I do it all the time. Pull up your video, drag the timeline to the image you want a still of and simply hold (cmnd+shift+4). This will bring up a selector of sorts. Start at the top left corner and drag the dotted line across the image you want to screen grab. Then, just let go of the mouse when you’ve selected your image. The picture will appear on your desktop as a .png file. Hope this helps.